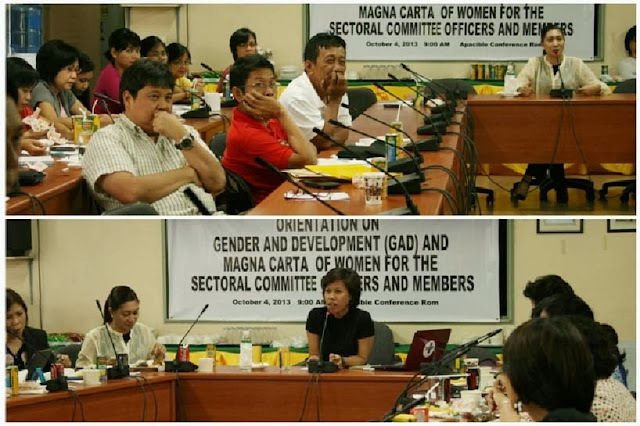 To raise the awareness of the agency’s partners in the National Sectoral Committees (NSCs) about Gender and Development (GAD), the NAFC GAD Focal Point System (FPS) gathered NSC officers and members for an Orientation on Basic GAD Concepts and the Magna Carta of Women last October 4, 2013 at the Apacible Conference Room. The speakers for each topic were Ms. Mildred Mercene-Buazon, OIC of the Administrative Division of the Bureau of Fisheries and Aquatic Resources (BFAR) and Vice Chairperson of the BFAR GAD-FPS, and Ms. Daryl Leyesa, secretary general of the Pambansang Koalisyon ng Kababaihan sa Kanayunan, respectively. Through the said undertaking, the NAFC GAD-FPS hopes to increase the consciousness of NSC partners on gender issues affecting agriculture and fisheries and underscore equal participation of men and women in policy formulation and decision-making. The orientation conducted was part of the NAFC GAD-FPS’ activities in its efforts of mainstreaming GAD.